My favourite assignments are the outdoor ones. 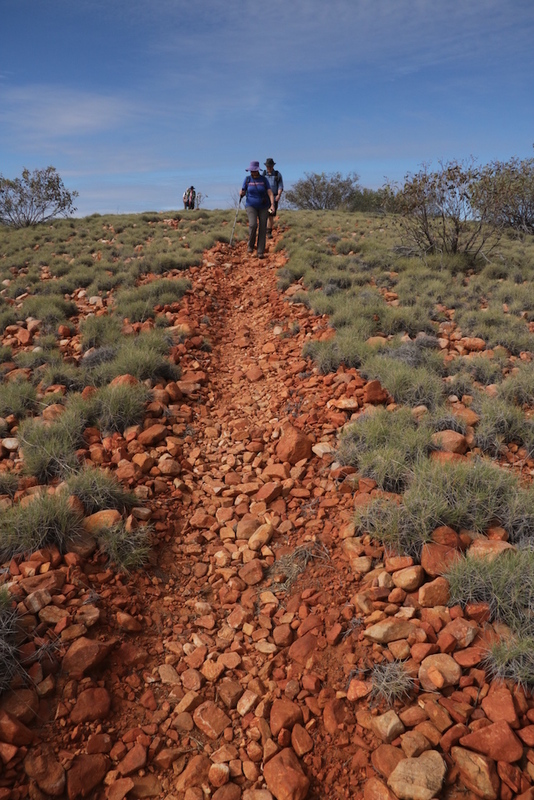 Like the six days I spent recently on the Larapinta Trail in Central Australia, in the Northern Territory. It was a week of connecting the dots between swimming holes and shaded gorges in the West MacDonnell Ranges. We slept in swags (in tents or under the full moon), ate fine meals prepared over campfires by our multi-talented World Expeditions guides and slowed life down to the pace of a stroll. I love the simplicity of walking across a landscape like this, noticing things you'd miss travelling any other way, but the surprise highlight of the trip was how mountainous Central Australia is. Waking up at 2am to climb a mountain by torchlight is not something you expect to be doing in the dusty, red-earthed middle of Australia. Yet here I am, with 12 others and our guides, walking in silent single file in the dark to reach Mount Sonder’s 1350-metre summit by sunrise. It’s not the only mountain-moment on this six-day Larapinta trek. All week as we walk west from Alice Springs through West MacDonnell National Park, we travel not across this semi-arid landscape, but up and down it. It starts on day one when we amble up the back of an escarpment and suddenly find ourselves on Euro Ridge, facing a precipitous drop and forever views – of neighbouring ranges running roughly east-west, all part of the West MacDonnell Ranges.